In May 1892 Suzanne Aubert established a religious order at Hiruharama (Jerusalem) on the Whanganui River, the Daughters of Our Lady of Compassion. She became the first Superior of the order five months later. Mother Aubert, known initially in her religious life as Sister Mary Joseph, began taking in unwanted Pākehā children at Jerusalem, and grew interested in social work among the urban poor. She had arrived at Hiruharama in 1883 with a priest and two other sisters to revive a Catholic mission in the community, following a request from local Māori. She was fluent in three languages – her native language of French, te reo Māori and English. 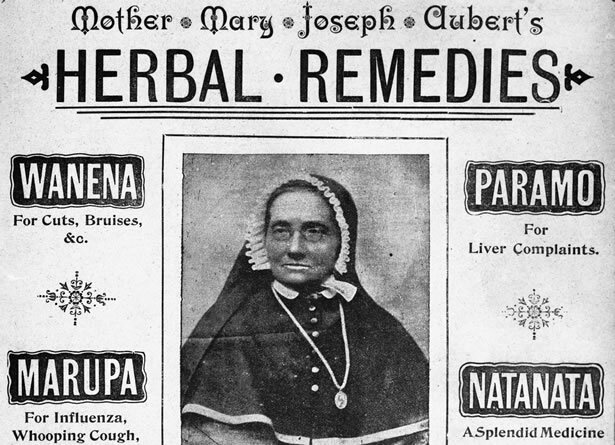 During her time at Hiruharama, Mother Aubert published a Māori–English phrase book and for a period adapted Māori herbal rongoā (medicine) as home remedies which were bottled and sold to the public to help fund the mission. Mother Aubert had learned about the medicinal properties of native flora and fauna from Māori during her time in Auckland and Hawke’s Bay. In 1899, Mother Aubert and the Daughters of Our Lady of Compassion arrived in Wellington. They set up St Joseph’s Home for Incurables in Buckle Street in order to nurse those suffering from incurable diseases that had nowhere else to go – mainly older men with no family. As well as establishing a day nursery for babies and children, Our Lady's Home of Compassion was opened in Island Bay to care for disabled children and ‘foundlings’ – babies born to unmarried mothers or parents who were unable to provide for them as a result of poverty. Mother Aubert created these facilities to support the impoverished of all faiths and had strong support from the general public and the medical profession. The sisters were a familiar sight walking the streets of Wellington with their prams which were used to collect donated goods, including food for their soup kitchen. By the time Mother Aubert died aged 91 in 1926, she was a highly respected and beloved figure. Her funeral on 5 October was widely reported as the largest ever accorded a woman in New Zealand. In 2016, Pope Francis declared Mother Aubert ‘Venerable’, an important milestone on the journey to a person being declared a saint. We have 18 biographies, 5 articles, related to Suzanne Aubert appointed Mother Superior.